Sarasota Bay is home to a myriad of inshore species of fish. Snook, trout and redfish, besides having game fish status are also known for their excellent table fare. There are also a host of lesser known but equally as feisty quaries. Pompano, mackerel, bluefish, Jack crevalle, ladyfish, flounder, black drum, and sheepshead are also frequent catches and many of these can put on quite a show as well as a nice reward at dinner after a memorable day on the water. May, June, and July are the months for Tarpon. 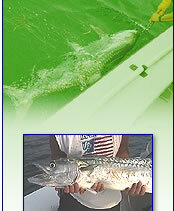 Fish 50-150 lbs cruise the beaches and can be taken with fly or spinning tackle. If you're looking for some shots at some really big fish this is the time to do it. These are also the calmest times and perfect for venturing out to the reefs. Out on the reef you can expect a lot of action from King Mackerel, Spanish Mackerel, Little Tunny, Barracuda, Black Tip Shark, and Permit. Sarasota Bay has many scenic bird islands and healthy sea grass beds where marine life abounds. There is always some remarkable portrait of nature coming into view whether its a family of manatee grazing on a bed of seagrass, an osprey keeping a watchful eye, or a flock of rosete spoonbills scouring a mud flat. Captain Jim has fished these waters for 20 years and is a member of the Mangrove Coast Flyfisher Association. You will be using Loomis Rods with Diawa and Tibor reels. All flys supplied are local patterns, most tied by Captain Jim. The Reel Dreams II is a custom 20' SeaCraft Master Angler. She's equipped with two livewells, jack plate, dual trolling motors and plenty of dry storage. My new boat is capable of getting in shallow and going offshore on calm to moderate days. " I'll guarantee you won't find a better ride".